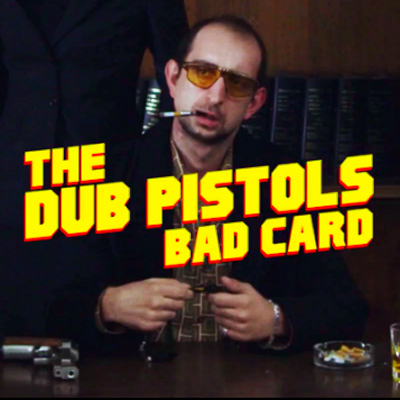 After reaching the dizzying of no.1 on the Beatport DnB chart and no.2 on the Reggae Chart with their last single 'Gunshot', breaks luminaries Dub Pistols proudly present 'Bad Card', the latest single taken from the critically acclaimed studio album 'Worshipping The Dollar', out now on Sunday Best Recordings. Featuring Sir Real's trademark style and Dan Bowskill's lyrical prowess, 'Bad Card' arrives just in time for the summer months. With punchy keys immediately setting the tone, bright, echoed brass, and driven dub bass lines; the overall result is a direct, hard-hitting, brightly pulsating track that will be the soundtrack to your carnivals and glorious street parties. With remixes from Max Powa, Mafia Kiss, Leuce Rhythms, Dirty Dubsters and General Narco this brand new package from Dub Pistols offers up a variety of formulations on what is one of the brightest, dance-inducing highlights from 'Worshipping The Dollar'. And to celebrate the release, Dub Pistols will headline XOYO in Shoreditch on May 26th with special guests TBA. They also headline Sunrise Festival and play Glastonbury, Kendal Calling, Beatherder, Lounge on the Farm, Reddest and Nozstock Festival this summer, with many more festivals and dates to be announced shortly.